In the past 9 years of I Love to Listen Day celebrations we’ve heard from people in 30 countries who have deliberately promoted listening in their communities. For example, in South Korea an executive group conducted a listening workshop, in Nevis, a radio program was dedicated to listening, in the USA, an elementary school spent the morning reading poems on listening that were written by the students. This year on May 16th everyone is encouraged to start a listening tradition in his or her family. Yes listening is hard. It requires time, patience and discipline but the rewards are great. Start a listening tradition in the family by using the 80/20 rule. That is, listen 80 percent and talk 20 percent of the time spent together with family members. Our lives are full of distractions that leave us with just enough time for small talk and factual conversations. On May 16th, I love to Listen Day, give someone the opportunity to share his or her ideas, feelings and maybe even some deep insight. Hardly a day goes by that I don’t hear from someone whose life has been changed by just the awareness of listening. A call to listen is a call to action. Let’s celebrate Listening! Cheers!!! Marva Shand- McIntosh is the founder of I Love to Listen Day. Let others know what you are doing, share your listening activities on Facebook. Go to https://www.facebook.com/ilovetolisten . 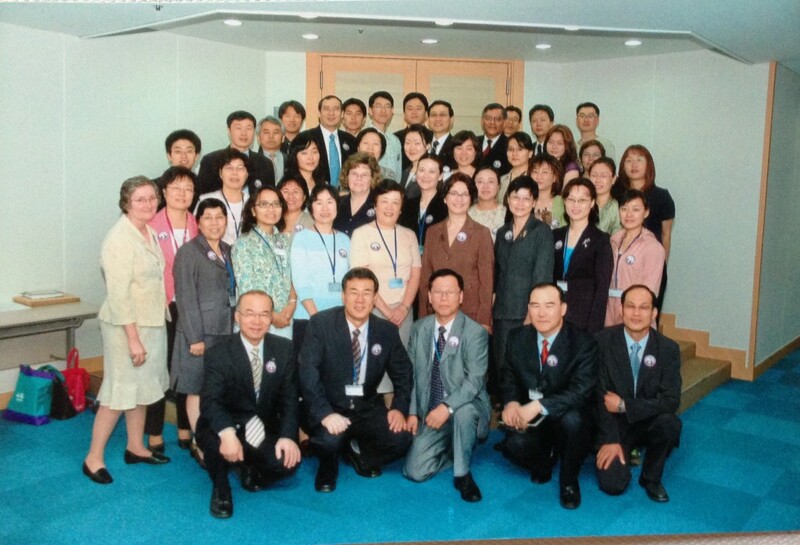 “We gathered to take a photograph to commemorate the celebration of the first “I Love to Listen Day on May 16, 2006. Participants came from countries all over the world – Korea, Japan, China, Taiwan, Hong Kong, South Africa, USA, Malaysia, Peru, Canada, and Brazil. We also distributed I Love to Listen buttons to everyone.” – Dr. S Lam-Phoon, Director, Northern Asia-Pacific Division, Republic of Korea. “Thank you Marva for all that you are doing to help “Advance Listening Around the World.” – Dr. Lynman K. (Manny) Steil, CEO International Listening Leadership Institute. “We did celebrate “I Love to Listen Day” in my class at Florida Gulf Coast University.” – Dr. Maria Roca, President, International Listening Association.